Keep your beverage warm on the trail or during a long commute with the Infinity Backpacker Mug. 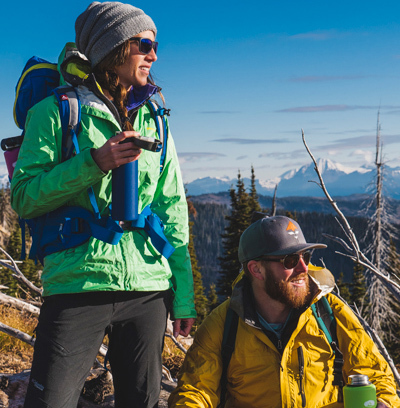 Made from BPA-free, non-leaching polypropylene, this essential piece of gear comes with a cloth-wrapped insulated neoprene sleeve, non-slip footing, and sealable Sip-It lid to keep the contents warm (or cold) and free from spills, trail dust, and critters. A sturdy webbing handle gives a great grip, then collapses flush for compact storage in your pack. The Infinity Mug holds 17.5 fluid ounces but weighs just 3.5 ounces, making it light enough for even the choosiest, ounce-shaving through-hiker. All GSI Outdoors products are fully warranted to the original owner against manufacturer's defects in materials and workmanship. WARNING: Not intended for prolonged storage of food or liquids. Hand wash with mild detergent in hot water. Use only non-abrasive cloths and cleaners. Microwaves and dishwashers may prematurely age components. Always allow components to dry completely before storing.